It’s common knowledge that living in a city as large as New York can be chaotic, and the laws meant to provide order and protect citizens can be beyond confusing. Wouldn’t it be helpful to have a user’s guide for navigating key NYC laws? Artist/graphic designer Candy Chang is doing her part to help make tenants’ and vendors’ rights more understandable for the people they affect. New York’s official Tenants’ Rights Guide is notoriously dry, confusing, and difficult to navigate. Finding the answer to your renting-related question is not a simple task, but Candy Change believed it should be. 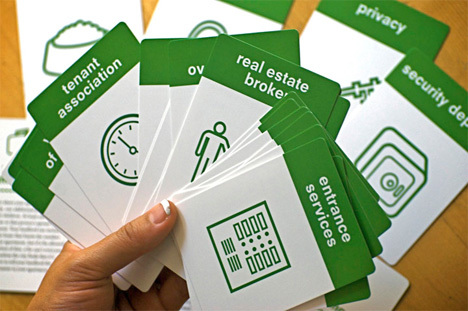 Working in cooperation with non-profit organization Tenants & Neighbors, she turned the Tenants’ Rights Guide into a set of snazzy, easy-to-read flash cards. You simply find the topic you’re looking for, like eviction, security deposits, or pets, and the corresponding flashcard has a paragraph explaining your rights in easy-to-read language. Chang’s vision was to make vendors’ rights a more friendly, fun topic. It’s doubtful that the subject itself will ever really be fun for anyone, but flipping through the pack of flashcards definitely sounds more enjoyable than flipping through the official Tenants’ Rights Guide. 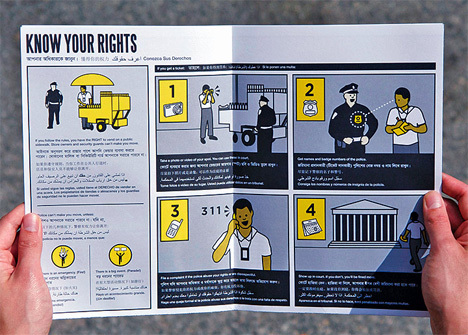 Candy Chang has also designed a pamphlet outlining vendors’ rights in an easy-to-understand, multilingual format. The guide is called Vendor Power! 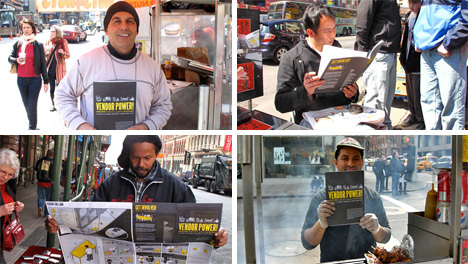 A Guide to Street Vending in New York City, and its illustration-rich fold-out format makes even the mundane subject of street vending laws look fun. 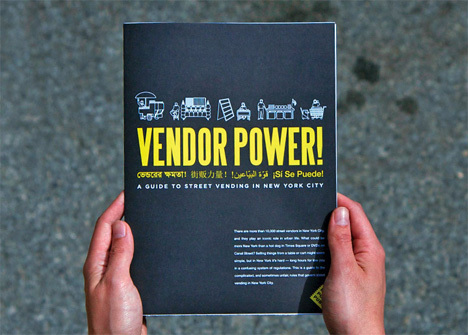 Chang worked with The Street Vendor Project and the Center for Urban Pedagogy (CUP) to put together the guide that’s meant to help street vendors avoid fines and understand their rights. The guide is reminiscent of Ikea assembly instructions: light on the text, heavy on the pictures. The small amount of text that does appear on the pages is in English, Arabic, Spanish, Bengali and Chinese. But along with the explanations of various laws and codes are personal stories from vendors, fun facts about the history of street vending in New York City, and other tidbits that can be seen as attempts to increase camaraderie and pride among street vendors. These two design project are more than the typical overpriced art objects that many designers churn out. They’re about real, tangible social change from the ground up. They’re empowering the people of New York City by informing them of their rights in language that’s easy to understand rather than the legalese in government-supplied handbooks. And that’s enough to change the social landscape of a city significantly. 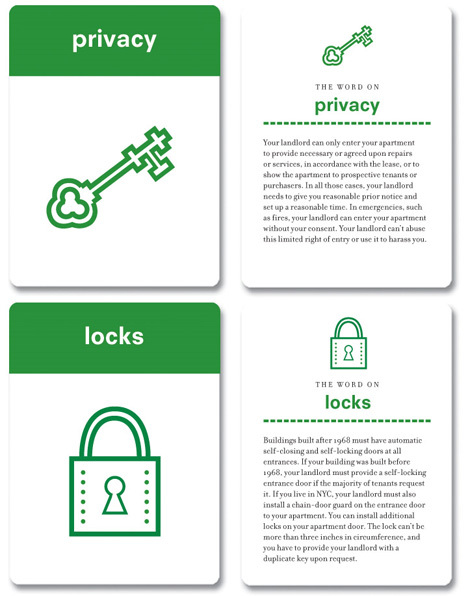 You can purchase your own set of tenants’ rights flashcards in the Tenants and Neighbors online store for $10, or get Vendor Power! for $6 (or download a PDF version for free) from CUP’s online store.